Kourabiethes are a Greek biscuit, made at Christmas, Easter and Weddings. The texture is very much like shortbread with the addition of brandy and almonds. 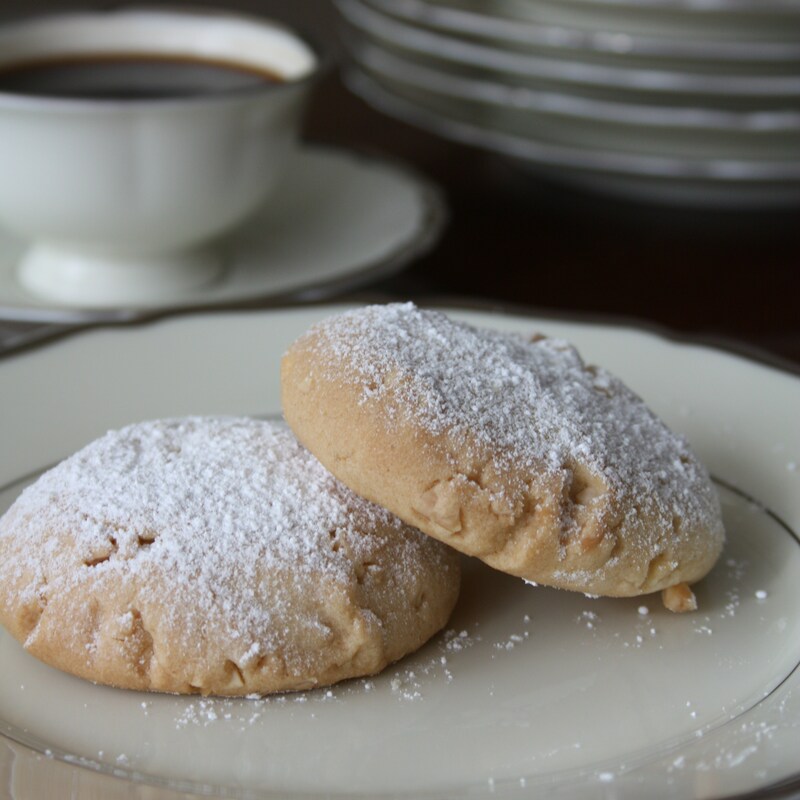 These biscuits have been made for generations and there are so many variations of the recipe. I use my great grandmother’s recipe. I like the thought that a hundred years on I am re-creating her recipes, which no doubt she took from her mother, and so it continues. I don’t think when she was writing the recipes down, she would ever imagine that her book would be read and treasured and her recipes cooked in an English kitchen. What she wouldn’t know is how much I struggled with translating her writing and in places her lack of instruction! I am guilty myself of writing the recipe down in a shorthand style. In the picture the Kourabiethes sit on her plates and so without too much imagination I can guess that those plates have seen kourabiethes many times in the past. What we eat is so important to keep us alive and healthy but it has many facets, the saying food for the soul is a very true phrase. These biscuits are for me food for my soul and a thin golden thread that links me into a past and a tradition. The biscuits are normally made in a small domed bun shape or a crescent shape. I have read somewhere that is this is because during the Turkish occupation of Greece, the Turks insisted that the biscuits be cut in a crescent to represent their flag. I just don’t know if this is true . I have made some changes to the original recipe. Firstly I didn’t soak the almonds in cold water overnight and I didn’t beat the butter and sugar for 2 hours. What I did do is use the K beater on the Kenwood. Is it any wonder these biscuits were saved for extra special occasions, there must have been some pretty strong biceps around! 120 gms/ 4 oz almonds skinned and chopped. For a better flavour either roast them in the oven or in a pan, I prefer the pan method, toss them in a dry frying pan until they start to take on some colour, remove and leave to cool. Put the softened butter into a bowl (if possible a Kenwood or similar) and add the icing sugar, beat for 20 minutes, the longer you beat the crisper the biscuit. After 20 minutes the butter will have become very pale and creamy, add the brandy, then add the flour, ground almonds and baking powder and mix slowly until a dough has been formed. When touched it should not stick to your hand if it does continue to mix a little longer. Taking a spoonful at a time, roll in your hands lightly into a ball and place onto a lined baking tray flattening them a little. To make sure all the biscuits cook evenly weigh each ball as you form the biscuits (30gms per biscuit is fine – I made mine 35 gms). Place in the middle of the oven Gas mark 3/160 for 20-30 minutes (in my oven I cooked the biscuits for 35 mins) until they just start to take on some colour. When cooked remove the biscuits and cool. To serve either put icing sugar in a bowl and toss biscuits in until completely covered or sprinkle icing sugar on with a sieve. These biscuits keep really well in an airtight container but leave the icing until they are ready to serve. Saying that all the biscuits I have had made for me and sent in the post have all been coated in icing and taste lovely – its up to you. The rumour is that kept in an airtight container they can last up to three months, I have never managed to keep them more than two weeks, they get eaten.